Is this silk pillowcase the best anti-ageing "product" a woman can buy? If you love sleeping as much as I do, you're about to be thrilled! Now, ladies, we've all had people with b-e-a-utiful skin tell us to sleep on silk pillowcases, am I right? But at the end of the day, if sleeping on a silk pillowcase means one more trip to the homeware store, chances are we're going to be sticking to cotton. Reality is, we spend a third of our lives in bed sleeping. Whether you take advantage of this time to apply skin treatments, hair masks, or even just to keep your teeth straight (shout out to my retainers! ), the pillowcase you sleep on makes a big difference. 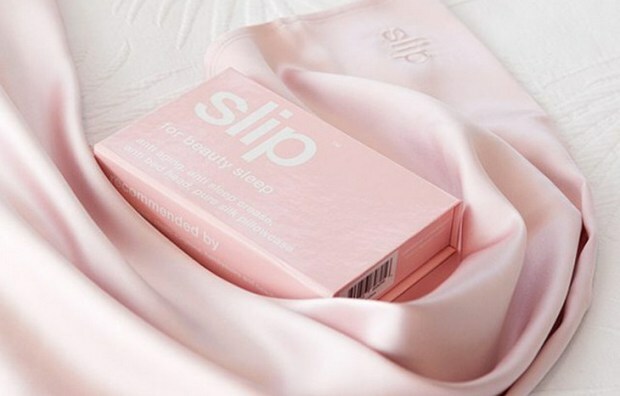 I decided to test drive a Slip silk pillowcase to see what all the fuss was about. I was surprised to discover that silk pillowcases do more than just prevent those weird creases on your face. They also help with anti-ageing and anti-bed head! Plus, they allow your skin to glide comfortably while you’re tossing and turning at night. A normal cotton pillowcase doesn’t allow for this. Instead, it absorbs moisture from your face and tugs at it – both big no-nos! Silk pillowcases are also gentler on your hair. I normally shower and wash my hair every morning, but since changing my pillowcase to silk, my hairstyles have stayed intact overnight with minimal oiliness. See where this is going? Thanks to my silk pillow case, I don’t need to wash and style my hair every morning. This equals to more sleep, and healthier, better-looking skin and hair! Slip silk pillowcases are made of mulberry silk with a thickness of 22 momme. Not fluent in silk speak? It basically means these cases are legit. Better than cotton, satin, or 100% silk. The cases are also made with non-toxic dye, which is huge for people like me who invest in organic skin- and haircare. And, while Slip pillowcases are a tad pricy – as we’re constantly reminded – you get what you pay for. After sleeping on a Slip pillowcase for two weeks, I’m sold! You can buy yours online at slipsilkpillowcase.com.